How to leverage the latest video delivery and analytics technology to deliver high quality experiences that wow! Figure 2: From which device do you watch online video? Figure 6: What is the most frustrating aspect of watching video online? Figure 7: How many times can an online video buff er before you abandon it? Mobile accessibility has become a powerful force in the video market. Video viewing was once confined to the home, but smartphones, tablets, and other connected devices are radically changing consumer behavior. Viewers can now access their favorite content from anywhere at any time. Consumption patterns are also changing as viewers increasingly watch shorter videos while on the go, rather than dedicating time to watching longer content at home. Viewer expectations are also increasing. While mobile video was once a novelty, mobile viewers increasingly expect the same level of quality and experience they receive from traditional broadcast television. This creates additional challenges for content distributors who need to reach this increasingly mobile audience. Fortunately, there are tools and metrics available today to help content distributors optimize the mobile video experience, increase viewer engagement, and maximize revenue. Market trends versus forces. Which one matters most? According to Mark Ruskino of Gartner, there is a clear distinction between market trends and market forces. The former simply describes something that is happening—some trend examples include: Android increasing its market share over iOS; the number of smartphones increasing each year; and the growth of online video consumption. The latter, on the other hand, describes a behavioral change (brought about by technology)—an example of market force includes: Android users consuming 25% more online video than iOS users. Although market trends and market forces are tightly coupled, it is market force that requires an organization to take some action. Traditional broadcasters may not really care that there are more smartphones in the market, but they will take action against a market force that indicates that more people are using those devices to watch their content. Based on data of smartphone shipments, it is clear that mobile phones are continuing to grow in popularity. As sales of mobile devices continue to grow, consumers are increasingly using them for online video viewing. 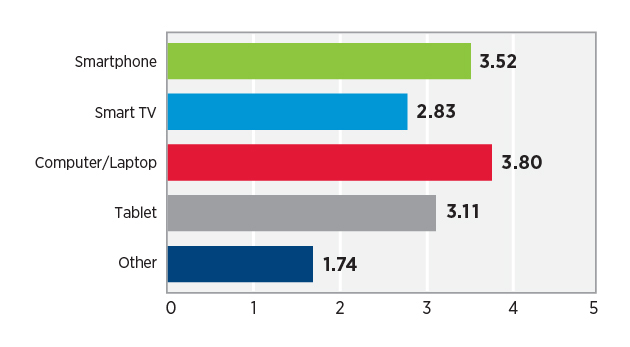 Limelight Networks’ recent State of Online Video report1 shows viewers use mobile devices and laptops more often than TVs to watch online video. Figure 2: From which device do you watch online video? Rank in order of frequency. The data above illustrates why it is more critical than ever for content distributors to ensure their content can be consumed on these smaller screens and at the high quality consumers expect. As video consumption on mobile devices continues to grow, the method of consuming content on these devices is also changing. The most recent example is with Live Video being integrated inside social networks and apps, specifically sports broadcasting on Twitter and Facebook. The goal of this integration is the convergence of the video and online social experience into a single screen that displays both the online video and the user’s social messaging feed. Content owners are responding to these powerful forces by tailoring their video content for mobile devices. But how can an organization ensure that its audience is having the best experience? Not only does the content need to be formatted correctly and delivered quickly, but video owners and distributors must take into account the variable nature of the mobile environment—users are roaming on mobile networks that often have uncertain and variable bandwidth. The answer to that question lies in the approach. In order for organizations to deliver the best possible mobile video experience, they must employ the right delivery architecture coupled with a platform to capture and measure real user experience data. Only through understanding the end-to-end experience can organizations make the adjustments needed to optimize mobile video consumption. Today, virtually all mobile devices are capable of playing online video. However, these devices require video to be formatted to meet specific device requirements from screen size to packaging (i.e., HLS, DASH, etc.). 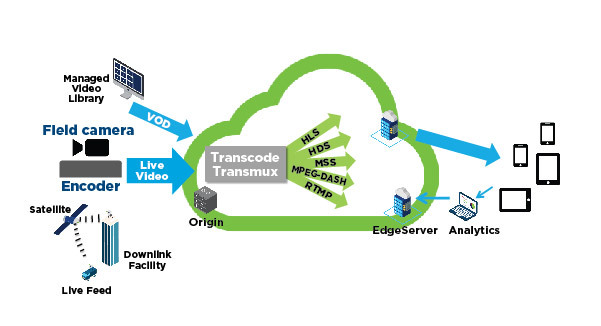 Although pre-converting video or delivering multiple streams from an encoder is an option, it usually creates additional costs for storage and complicates the publishing workflow. In addition, delivering video necessitates a geographically-distributed infrastructure located near end users to reduce the amount of latency involved in retrieving content and provide the best viewing experience. In this diagram, the major pieces of a Live or on-demand video workflow are shown. All of the pieces of functionality are integrated together for an end-to-end solution. The important point is that media companies can choose which cloud-based functionality to outsource and which portions of the workflow they want to handle themselves. It is common for large video publishers to do transcoding, transmuxing, and content packaging in house because of their expertise. Smaller organizations and start up video services tend to outsource the entire cloud-based workflow so they can focus on what’s really important—sourcing or creating great new content, while providing a great end-user experience. When it comes to ensuring the best possible delivery experience, one Content Delivery Network (CDN) may not be enough. In a multi-CDN deployment model, various CDNs can be compared in real-time using a variety of different metrics—throughput, time to first byte, average bitrate, etc.—and traffic can be switched based on thresholds and performance. This ensures delivery is being handled by the best performing CDN and in the event of an outage or failure, delivery isn’t interrupted. However, having an efficient workflow isn’t enough to guarantee a high-quality viewing experience for your viewers. Unless you are actually measuring the end-user experience, it’s nearly impossible to tell if the experience is great, mediocre, or just plain bad. Video is becoming a more integral part of the daily experience of consumers on the go. As audiences turn to their tablets and smartphones to watch their favorite movies, TV shows, and sports content, providers are rushing to accommodate. Whether it is permitting offline availability of certain content or tailoring their service to mobile devices, one thing is clear: the mobile video experience is becoming highly personal and user-centric. These days, our phones are extensions of ourselves, and audiences are demanding experiences as reliable and unique as they are. 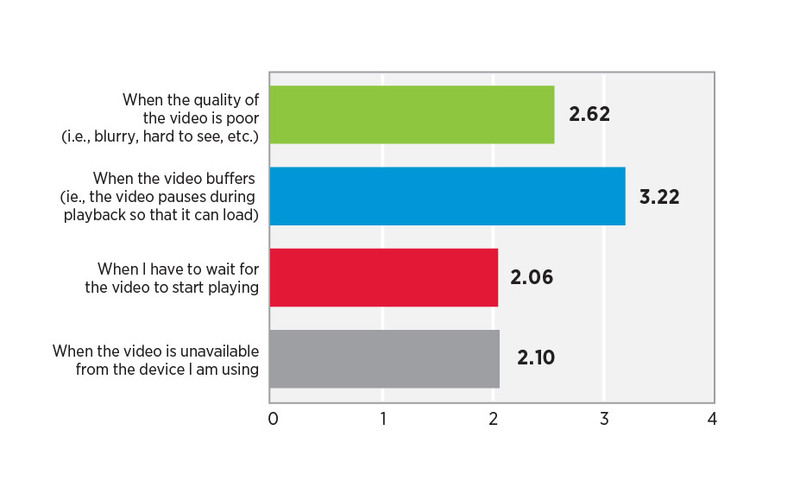 In a survey of more than 1,700 consumers for Limelight Networks’ The State of Online Video (December 2016), the results show viewers becoming frustrated with online video due to multiple factors: poor video quality; video buffering; waiting for video to play; and lack of support for their device. Figure 6: What is the most frustrating aspect of watching video online? Rank in order of importance. Fortunately, there are easy ways network operations centers can make real-time measurements of the delivery of video content to take preemptive action before any degradation in video quality occurs. The insights derived from this analytical data are critical in making sure the content delivery infrastructure is tuned for optimal video delivery. Data from measurements of actual mobile video viewing reveal insights into how to optimize the video experience in a mobile world - comparing data on Exit Before Video Starts (EBVS), Join Time, Buff er Ratio, Interruptions, Playtime and Bitrates between Live and VOD content. NPAW (Nice People at Work) is a Big Data and Business Intelligence company serving the online media industry. As part of its services to help companies deliver optimal online video experiences, NPAW captures data from actual users all over the world. This data offers valuable, actionable insights into consumer behavior in viewing online Live Video, as well as Video on Demand(VOD) content. NPAW’s data compares how audiences for Live and VOD content behave on mobile devices and provides valuable insight into the end-user viewing experience. In the following pages, we will review how playtime varies between Live and VOD content and how buffering and EBVS affect user engagement. These metrics provide useful insight into how content distributors can help drive efficiency and boost revenues by improving the viewer’s Quality of Experience (QoE). Prolonged join time (the amount of time it takes for a video to commence playback) can lead to users abandoning the video before playback begins, especially with short form videos. This is known as Exit Before Video Starts (EBVS), however, audiences of different content formats differ in their propensity to wait for playback to begin. Data collected by NPAW2 indicates that audiences for VOD content are more likely to exit their playback before it begins, 135% higher than for Live content. The reason behind this phenomenon is the nature of VOD as compared Live content. VOD content will still be available for playback at a later time. However, a Live event is better experienced during the Live broadcast, rather than during a later playback. This difference drives Live event audiences to be more patient with the duration of their video’s join time. That greater “tolerance” could also be indicative of an audience being more engaged with their selected content. Upon closer inspection, more insight is revealed. By filtering the data based on operating system for Live and VOD content, we see iOS users are 3x times less likely to exit a playback before it begins than Android users, regardless of whether they stream Live or VOD content. This is a significant difference, especially when compared to the average EBVS likelihood of about 14%. This speaks to the fragmentation between iOS and Android users. The source of the disparity may be explained by the nature of creating mobile video streaming applications for iOS and Android devices. The iOS platform only needs to support a limited number of hardware devices, screen sizes, and OS versions. The Android platform is used on an extensive number of devices that support many different screen sizes and hardware options, creating additional challenges in managing and optimizing the video playback process. Join time is the amount of time it takes for playback to commence. It is the “first impression” that video makes upon its audience, and it is important that join time is minimized as much as possible. Although there are fluctuations throughout the day and week depending on the number of simultaneous viewers, for mobile devices, NPAW’s data indicates the average join time for Live events is 1.9 seconds, 3x times faster than VOD (at 5.9 seconds). However, it is worth mentioning that overall, when compared to other devices, join time for mobile is much higher than non-mobile device playback. When narrowed down by OS, iOS users initiating VOD playbacks experience longer join times than their Android counterparts. However, for Live events, iOS users connect about 14% faster than Android users. Buffer ratio is another important metric in determining the quality of the viewer experience. This metric is expressed as the proportion of an asset’s overall playback duration that is spent reloading video content. Overall, ratios of 3.96% and 2.29% appear for Live and VOD content respectively. Rebuffering leads to abandonment of video playback, so content distributors have been working to minimize these occurrences. 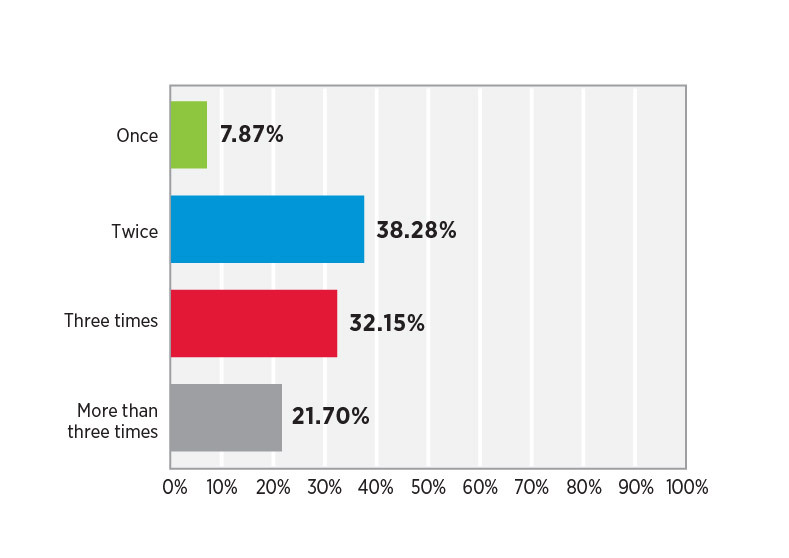 The data below from Limelight’s The State of Online Video (December 2016) reveals high abandonment rates after two or more rebuffering events. Figure 7: How many times can an online video buffer before you abandon it? The wholeness of a playback can be determined by measuring the average amount of interruptions a user experiences, measured in seconds. On average, Live audiences experience approximately 77% more interruptions than their VOD counterparts. 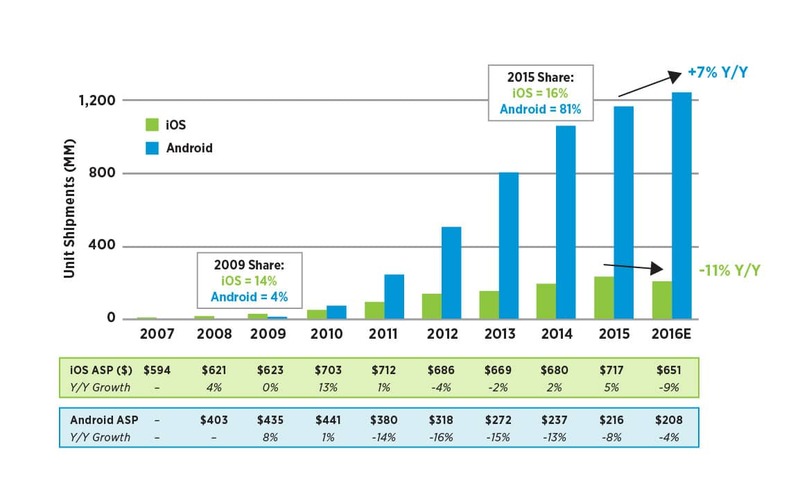 Android OS users will experience 4x more interruptions than iOS users. Playtime is defined as the duration of a continuous video viewing session. In terms of average playtime, VOD content outperforms Live on mobile devices. The average Live content viewer will remain for 14 minutes 12 seconds, as opposed to 21 minutes 24 seconds for VOD. That equates to VOD audiences remaining with their content choice 50% longer than Live audiences. When viewed by operating system, we see iOS users watch content for longer durations than their Android counterparts, an average of 19 minutes 18 seconds for VOD and Live. Android users average a viewing session significantly less than that, at around 15 minutes 24 seconds. Overall, iOS users watch Live content 37% longer than Android users, and VOD content with only a small difference of 3%. Bitrate is the amount of data transferred from server to user per second of streaming. Mobile devices typically have a lower overall bitrate than other devices. This is because of the smaller screen sizes of phones and tablets, as opposed to larger displays of devices such as television sets. NPAW data shows an average bitrate of 2.01Mb/s for Live content, and 2.03Mb/s for VOD on mobile devices. Another variable impacting bitrate is the video’s resolution quality. Users streaming over their mobile carrier’s data network are often limited in the amount of data they can stream. Content distributors often optimize the distribution of their videos by streaming assets in lower bitrates to mobile devices to improve the playback experienced by the end-user while minimizing data usage. Most popular (most played) channels for a timeframe, including how many times played. Detailed media analytics over a given report period, including the amount of time a video is viewed. Comprehensive channel performance metrics, including the number of times a channel is viewed and amount of time viewed. Comprehensive media engagement metrics, including the number of times the media has been played and the total number of seconds played. Comprehensive geographic metrics of how many times media has been played by country, region, city, or designated marketing area. Operating systems, browsers, and platforms (e.g. Flash, HTML5, etc.) that have been used to play the media. Storage and bandwidth statistics for the specified time period, aggregated over the time interval. YOUBORA provides an extensive array of metrics measuring Audience, Quality, and Engagement data with an unparalleled variety of dimensions and those referred metrics by which to filter – all in real-time at highest granularity. Engagement Metrics – how Quality of Experience (QoE) issues affect the total time users spend watching each video. Quality Metrics – how your service performs. Advertising-specific metrics are available as well. Audience & User Metrics – how your audience behaves and interacts with your content,, including advanced churn prediction and lifetime metrics. Unlimited multidimensional filtering by device, GEO, content, IP, User ID, errors, network dimensions such as CDN, ISP, connection type, and more. Analyze past data without any loss in granularity or precision. Add any dimension to the filter and see how data splits with all freshly created filters in real-time, visualizing how you can transfer from one day to several months. Filtering supports inclusive or exclusive configurations, as well as grouping values - for example you can select whether you want to see a specific group of countries, excluding certain titles. Visualize your data in multiple ways with or without time dimension so you can graph metrics with the selected filters or just remove the temporal dimension to get KPIs for the selected period. Deep dive into specifics of devices consuming media by enabling new device-specific real-time filterable dimensions such as device vendor, model, and type. Viewers watch content from a variety of mobile devices, including smartphones and tablets. Delivering your content to any mobile device is a requirement for maximizing your audience. Although the online video industry is slowly moving towards just a couple of major formats, different devices may still require different versions of content. Pre-encoding all your content is an option, but you will need additional storage for formats that may be requested only a few times as well as extra encoding or transcoding time. A good way to handle this is to use a cloud service provider that can handle the content conversion on the fly by looking at incoming requests, identifying the required format, and automatically converting and delivering video to the requesting user in the correct format. As viewers have become increasingly mobile, they have begun to consume content from a variety of places—waiting in line at the grocery store, during a long cross-country flight, and even while on vacation. However, it’s not just the traveling user you need to reach – your potential audience can be located anywhere around the globe. If your content is compelling, users will find it no matter where they are located, subscribe to it, and expect you can always deliver to them. No matter where your viewers are located, they expect a consistent high-quality viewing experience. Failing to meet these expectations may inadvertently damage your brand if users post negative reviews about your service. Partnering with a CDN like Limelight Networks that has a global reach allows you to deliver a consistent experience to everyone, everywhere. Video content can sometimes go viral. When that happens, tens of thousands of users can flock to a single URL. Servicing all those playback requests necessitates the scale to meet it—enough servers with enough capacity with enough bandwidth to handle the load. When that fails to happen, you increase your chances of buffering, pages and videos failing to load, and other performance-related hang-ups – all of which stop you from providing the best user experience. To avoid these problems, use a CDN with a strong global presence that has the capacity to service flash-crowds and sudden increases in requests. Quality of Experience is the true measure of viewer satisfaction. Viewers are looking for broadcast quality from your online video and a premium experience across your entire platform. They want your service to operate just like television does. They want to smoothly navigate your platform and easily spot what they are looking for and consume it. To deliver that level of experience, you need to encode your content in the highest possible bitrates and ensure you have the delivery capacity to support your user base at a consistently high bitrate. To retain users, you need to better understand your viewers’ behaviors and optimize the experience. That’s why you have to focus on QoE. The company’s award-winning solution, YOUBORA, is the most advanced and holistic video analytics BI platform helping top-tier broadcasters, OTTs, telcos, and media companies gain a better understanding of how their audience behaves and how their platform performs across their entire video service (before, during and after the video playback) in real time. YOUBORA provides descriptive and predictive insights to help customers reduce churn and proactively manage users, increase ad and content efficiency, and overcome operational and technical challenges. 1 Limelight Networks State of Online Video report December 2016. 2 NPAW mobile data for online media services worldwide from June 2016 to May 2017.